Pop Art Minis: You Had Me At MOON...Mr. Toast's Creative Tuesday! 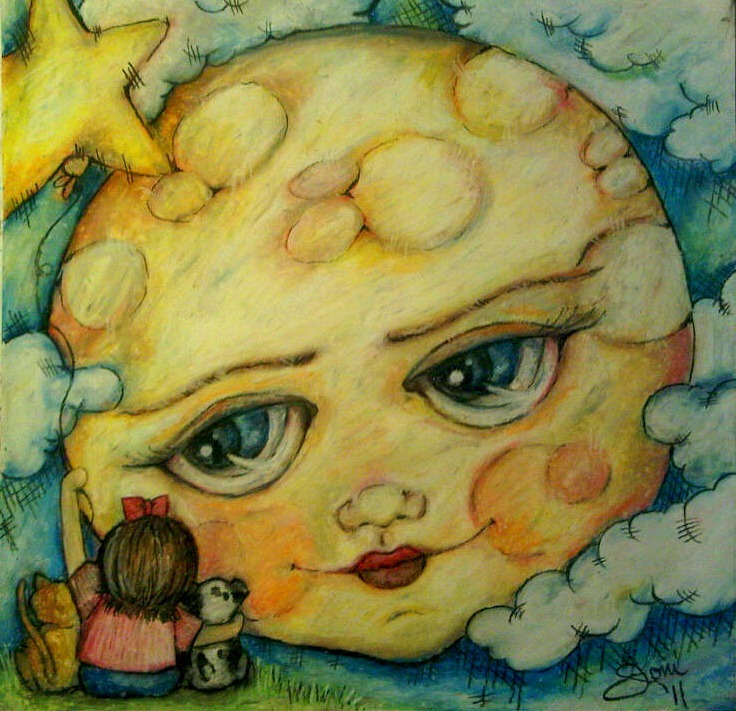 You Had Me At MOON...Mr. Toast's Creative Tuesday! Today when I was popping by some of my favorite blogs an awesome post over at Rose Hill Designs captured my attention...her adorable moon illustration! I LOVED It! And at that point I knew that I had to toss a moon or two, three...heck I'm tossing a barrel full of moons into this weeks linky over at Mr. Toast's Creative Tuesday. 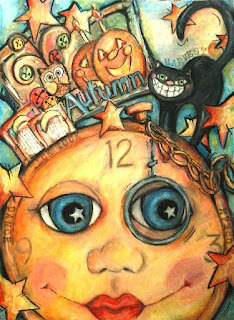 Just about everything I create has a moon hiding somewhere in the painting...or in some cases it's in full moon view. Here's a trip down Moon-memory lane with some of my fave moonshine minis! I'll stop here, but I could go on and on about the moon! Oh, Mr. Toast, you definitely had me at MOON, thanks for the creative linky! 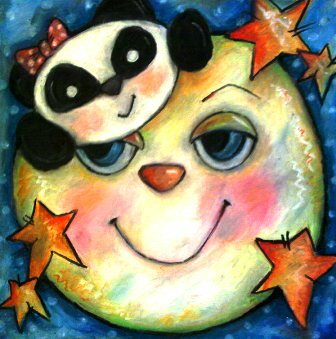 Pop By Mr. Toast's Creative Tuesday to see more awesome and creative moonbeams! OMG how many moons! :) I love them all but my fave have to the the second image with sun and moon, quite traditional but i can imagine this on plates and the cat on the fence with the moon in the background. I think it's the cheesy grin on the cats face which makes him look like he is either up to or done something naughty. All the other are fab too and i love the use of your colour! You DO love your moons! Hmmm, how to pick a fave? I think it might be the one with the bear draped sleepily over the top. No, the one with the cheshire grinning cat. No, definitely the last one with the little girl..... Love your use of color and the texture of the subtle circles. Perfect fit for this challenge! Wow, these are all so fantastic. I think my favourite is the moon with the bat, he looks kinda cute, but I also love the cheesy grinning cat. Actually I love them all! What a fabulous moon collection! My favorite is the kitty swinging on the crescent moon. Nice work...so colorful and fun. Oh my goodness...these are fabulous! I love that first one...so very creative! But the last one with the dreamy eyes? So cool! oh! Good golly miss molly!!! So many beautiful moons wow,, I love them all!!! Help!! Help!! I can't decide which one I love the most....Each one is a winner... I would say you gave us a "Grand Slam" today!!! Think they should be in a book for children. What a wonderful assortment of moons, lovely! Realy, really, like the one with the kitty hanging off the moon, sweetness! One is lovelier than the other! 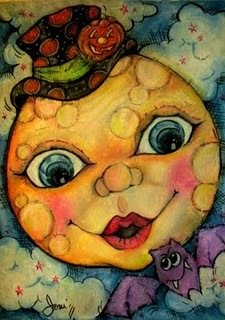 aw, thanks for the mention - i am glad that you saw it, so you could show us all of your gorgeous moons!!!!!! It's hard to choose, but I love the kitty with the moon!! 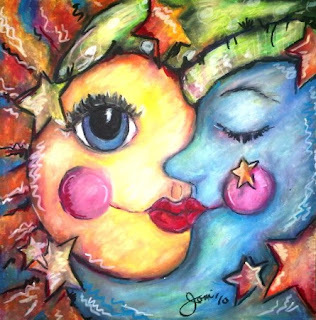 love all your moons Joni, such great detail as usual! 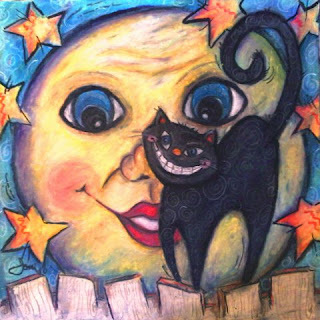 These are all so sweet - I especially love the black cat and moon! I'm a hopeless cat-lover (and moon-lover for that matter)! Great pieces! WOW! Thanks soooo much for all of the amazing and awesome comments! So happy to hear that you enjoyed the moon show! Mr. Moon is definitely a wonderful and cooperative subject! Please pop by anytime and I'll be sure to do the same with visits to your fantastically creative pages too! THANKS AGAIN! Oh these are all so gorgeous!! What a wonderful collection! The last one is sooooo fabulous! All of your moon pieces are amazing! They are so detailed, and bright! Joni, thank you for singing up and nice to meet you! Thanks so much for all of the wonderful comments! So happy that you popped by! 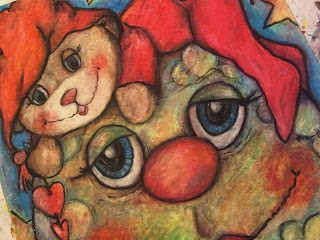 It was definitely a fun link up...that mr. moon is an amazing muse for sure! Look forward to more Mr. Toasty Creative Tuesday fun! Im so sorry I missed commenting earlier, I do love your moons! all of them, but my fav is also the one with the little balck cat, his expression is gorgeous! They are all so happy and thats a treat in itself! Thanks for sharing your moons!